Please tell us if a technique hurts. If there is extreme muscle tension, you might experience some pain, so just let us know! Not every client likes every technique or style of work, so please let us know if you do not enjoy part of your massage. Bathroom breaks can happen! If you need to take a moment for any reason, we are more than happy to accommodate. We are not here to judge your body. We are focusing on the deeper structures: fascia and muscle tissue, and not thinking about cellulite, stretch marks, or any other items you might be concerned about. Your Massage Therapist is the last person you should shave your legs for. Sometimes we will make recommendations for your health. These suggestions are based on what you have told us about your lifestyle and pain, as well as what we noticed during your massage. We might recommend some stretches or even a specific yoga class to further help with any issues. If you can honor these recommendations it will likely extend that wonderful post massage feeling! Please arrive before or as close to your start time as possible. We often have another massage booked right after yours, so starting late can affect more than just the Massage Therapist’s schedule. We want you to be able to receive your full massage. You can wear what you are comfortable in. Some people choose to leave their undergarments on and others choose to fully undress for their massage. We are trained in draping techniques to make sure you are comfortably covered during your massage. For some modalities like Ashiatsu, it is easier for the Massage Therapist if you fully undress, but remember to only undress to your comfort level. There are other modalities, like Sports Massage, where your Massage Therapist might ask you to bring athletic clothes. During your massage, you might wonder “Why would that spot hurt” or “Could that be why I’ve been getting headaches”. If you’d like more information, just ask! Keep in mind we are not doctors so we cannot diagnose but we do have knowledge of the human body that can help assess what might be going on. You might experience some dehydration, so make sure to drink plenty of water after your massage. You may feel sore for a couple of days but if you feel sore for more than 3-4 days please let your Massage Therapist know and we will make some alterations for your next massage. It’s become increasingly clear that we can’t see organ systems in isolation, like we did in the past. It’s very clear that the human is one entity: mind and body are one… We didn’t have the science to agree with what may seem intuitive. Now we have new data and new insights. That was the first experimental evidence that if you increased positive emotions and that led to increased social closeness, then vagal tone changed. 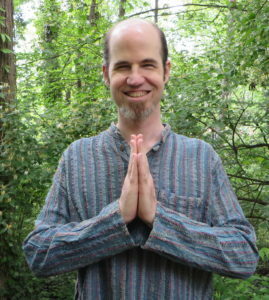 To connect and check-in with my students, I have long opened my yoga classes offering the general question, “How are you today?” Most often, as one student shares an answer, many others agree that they too feel similarly. With the news reports of the past few weeks, it is no surprise that my inquiry is currently revealing feelings of angst in many of us. The harder it is to breathe, the more anxious we get. Literally. As our breath grows short and shallow, our fear center is alerted, and our body reacts. We become tighter and more rigid, then breathing becomes harder still. This cycle begins and then feeds on itself, leaving us even more tense and anxious. And when we are in this cycle, it is neurologically impossible to feel “okay”. When a flight attendant tells us to put on our own oxygen mask before we attend to others, what we’re really being told is that we cannot help someone (or ourselves) in an emergency if we are at the mercy of our own anxiety. We become unable to thoughtfully attend to what’s going on right in front of us. And the truth is that most of us are in some version of this cycle all day long. In fact, we typically don’t even realize how minimized our breathing is most of the time. We’ve gotten so used to feeling restricted, we don’t have any idea that it’s not the way our body is naturally meant to feel. We can become “breathless” in the blink of an eye. In fact, the stress response initiates in about one-twentieth of a second—the time between two heartbeats. So if we feel provoked, scared, or humiliated or ashamed, our breath becomes short and shallow instantly, the same way it would if we were frightened and had to sprint from danger. The less freely we breathe, the more anxious we feel. The good news: Mindful breathing can break this loop. When we slow down our breath and become present, it’s like we are recharging ourselves. Getting grounded and becoming present are practices we do in tandem. We practice feeling our body land on the earth. And then we practice paying attention to the single thing that can unfailingly anchor us in the present moment: our breath. Breathing is not an “activity” we need to accomplish. It is simply a process that we allow to happen. But we can do practices to create conditions for the breath to flow more freely – which allows our body to feel more calm, and our mind more clear and present. As we practice letting go of effort and feeling the ground support us, we begin to experience the natural rise and fall of the breath. We notice that after an exhale, our lungs spontaneously and organically fill again with air. The breath is simply waiting for more room so that it can fill us. And we can begin to see how our breath is our life partner, always there for us—without question. Similar to the way we learn to rely on the support of the ground, becoming aware of our partnership with the breath reinforces our experience of connectedness. Of not feeling alone. Experience a 3-minute breathing video-practice that can help to calm your mind and center you in the present moment. Flow through a simple 3-minute sequence of mindful movement video-practice to expand your breathing, clear your mind, connect you with your body. Soren Fielland has a passion for drawing. 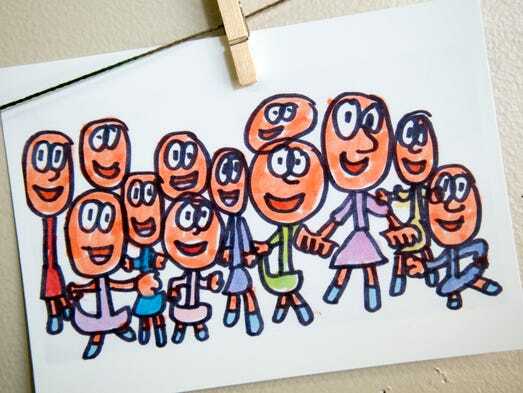 In the close to seven years he has been practicing his art, Soren has created thousands of drawings, an impressive feat for any child and even more impressive for a non-verbal, legally blind 12-year-old with autism. 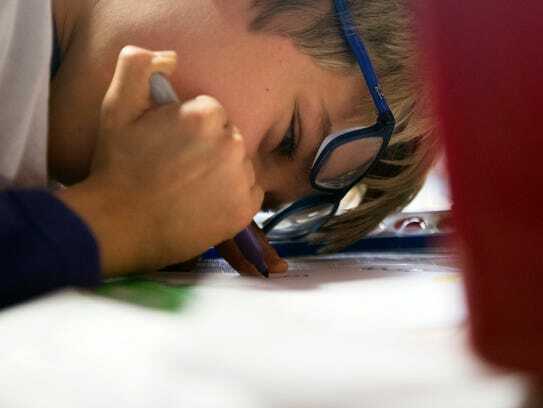 Soren, who attends Bearden Middle School in Knoxville, celebrated his 13th birthday a little bit ahead of schedule on Sunday with a public showing of over 100 pieces of his own original art at the Breezeway Yoga Studio on Kingston Pike. Drawings covered the studio’s walls while friends, family members and visitors admired the massive portfolio of work that Soren created. Shannon Fielland, Soren’s mother, explained that drawing has become a way for Soren to communicate with those around him and that his subjects have a way of working themselves into his limited vocabulary. “It helps us to know what’s on his mind, and then it also gives him something that he’s motivated to talk about,” Fielland said. 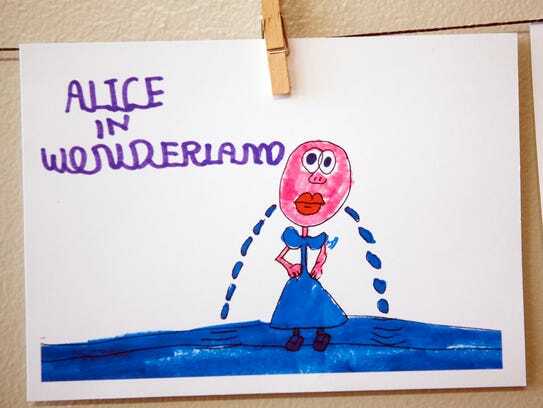 Soren frequently uses fairy tales and nursery rhymes in his drawings, Fielland said, as those stories have helped him communicate things that might otherwise have been challenging for him to share. She recounted a story in which Soren used a line from a common fairy tale to warn her about a hot cup of tea. Soren’s passion for art found an altruistic purpose on Sunday as close to 150 of his original drawings were put on offer during the celebratory show with a portion of the proceeds going to support the AfterStars afterschool program at West Park Baptist Church, which helps students with special needs explore their creative potential. Jill Summers, who works for the AfterStars program, explained that the program tries to provide a structure that allows students facing different challenges to grow and explore their interests in their own ways. 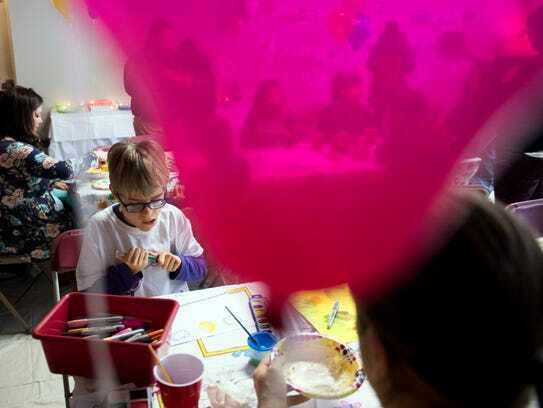 “Most of the time we try to embrace what the children like, what their interests are, and his interests are obviously art, so we make sure to have an environment that’s set up for him daily, so that when he comes in he’s happy,” Summers said. Hope Dunn, who also works with AfterStars, explained her joy in seeing Soren’s art become a vessel for supporting a program that he has thrived in. For Fielland, the support that her son has enjoyed and the passion he brings to drawing offer a lesson on confidence and the creative spirit for everyone. In addition to cancer prevention, a regular yoga practice with the soothing music from yoga DVDscan also help those who are battling cancer by lowering inflammation, boosting energy, and lifting the mood. One study showed that regularly practicing yoga for three months was effective in improving the negative moods of those undergoing treatment for breast cancer. Patty loves her beautiful mom, Rose Ann. Here they are at the Soul of Creativity event held recently at Breezeway. Researchers from HG SMS Hospital in Jaipur, India, presented the study at the 8th Emirates Cardiac Society Congress in collaboration with the American College of Cardiology Middle East Conference. The study looked at 750 patients who had previously been diagnosed with coronary heart disease. One group of 225 patients participated in aerobic exercise, another group of 240 patients participated in yoga, and a third group of 285 participated in both yoga and aerobic exercise. Each group did three, six-month sessions of their assigned exercises. Yoga was picked as one the the forms of exercise because of its practice of strengthening the body, mind and soul. The exercise focuses on connecting the mind to the body through poses and deep breathing, which has found to alleviate heart pressure and stress. Researchers wanted to see if yoga and aerobic exercise would have an effect on coronary risk factors of obese patients with type 2 diabetes. The findings showed that aerobic exercise only and yoga only groups showed similar reductions in blood pressure, total cholesterol, triglycerides, LDL, weight and waist circumference. However, the combined yoga and aerobic exercise group showed a two times greater reduction compared to the other groups. They also showed significant improvement in left ventricular ejection fraction, diastolic function and exercise capacity. ‘Combined Indian yoga and aerobic exercise reduce mental, physical and vascular stress and can lead to decreased cardiovascular mortality and morbidity,’ said co-authors Dr Sonal Tanwar, a scholar in preventative cardiology, and Dr Naresh Sen, a consultant cardiologist, both with HG SMS Hospital. If you think Downward Dog is a canine training command, perhaps it’s time for a basic primer on yoga — and its many health benefits. Whether you’re 8 years old or 80, a diehard gym-every-day athlete or a weekend warrior looking to up your exercise game, yoga can help. Regular yoga practice gets you in touch with your entire body as you move through the poses and flows. And when you’re more in touch with areas that are tight or sore, it’s more likely you’ll pay attention to what’s hurting before a potential injury becomes a real one. In the same way yoga helps prevent injuries, it also can serve as a safe way to get back into a fitness program following time away. For example, if you’ve had to step away from exercise due to injury and aren’t ready for high-impact activity yet or are recovering from illness or surgery — or even just living a busy life — yoga can serve as a fun, low-impact way to ease back into movement. In particular, look into restorative yoga. There all many types and levels of yoga classes, and restorative is great for beginners and longtime practitioners alike. The focus here is working on basic poses and holding them for enough time to help joints and muscles relax and loosen. It also increases blood flow and improves flexibility. Yoga is also a fantastic fitness option as we age. As a low-impact exercise, it’s good for anyone dealing with sore hips, knees or other joints. At the same time, yoga lets you work up enough of a sweat to help ditch those hard-to-shed pounds and build flexibility and strength that we often lose with age. 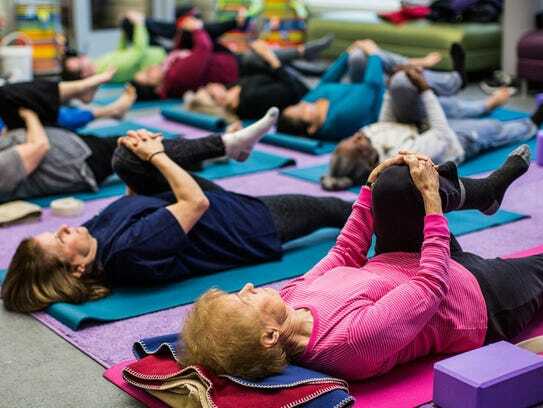 For 89-year-old Dean Stevens, the free yoga class she attends weekly at the Nashville Public Library, run by Small World Yoga and part of Be Well at NPL, has given her a newfound stability she says her peers are often lacking. Yoga brings all those benefits to anyone who rolls out a mat and starts building a personal practice. And that’s another beauty of yoga: It’s called “practice” because it’s about being quiet, calm and focused rather than accomplishing a set-lifting goal or number of reps. In that way, yoga encourages mindfulness, so you can connect with your body as you flow your way to better health. The intent of yoga is to link the body and mind. Yoga instructors cultivate the idea of directing our attention and intention to the body, to its movement in the present moment, and to our breathing. Yoga is also a good way to strengthen attention through mindfulness.